My Jupiter in Scorpio is on the Sabian Symbol, An X-ray. 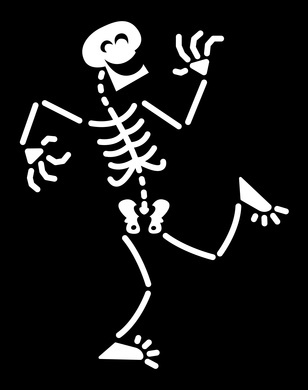 Over the years, I’ve come to attribute a lot of affinities in my life to this image, among them, my obsession with humorous dancing skeletons, Day of the Dead style. In fact, I have a thing for skeletons, especially seeing my own on x-rays—how literal. (One of my friends has this symbol on her Sun. Her career was in radiology!) Once I bought a blank greeting card with a hilarious drawing. It was a skeleton sitting at his or her computer with lots of cobwebs all around. On the screen it says, The Great American Novel. I still haven’t stopped smiling over it, as I’m sure I’ll still be striving to write great novels from beyond the grave. Lastly, my love of mystery and the mysteries of life represent the deep examination to the core of things that x-rays allow us to do—to make out things you cannot see with the naked eye. Recently, I had a healing experience that reckoned back to my x-ray Sabian symbol in a way I had not expected. I felt compelled to share it and hope that it’ll give you pause to look at your Sabians in a new way. Old Symbol, New Application. I’ve been having major back issues. I am not a wimp when it comes to pain. In the course of my life, I’ve lived with a lot of it, both physical and psychological. Case in point, when I had a hysterectomy in the 1990s, a rampant case of endometriosis was discovered as a secondary diagnosis in the process of dogging the primary problem. Half my medical team was comprised of women, and they could not believe I could stand, much less walk around, with that level of the disease. Most women would be doubled over in pain. And so it has been with my back and me. I had not been able to move forward in ways that are essential for my husband and me to get on with the rest of our lives. I had little energy (very uncharacteristic of me), craved excessive amounts of sleep, and just could not seem to start my engine. Granted, I’m coming off a year that challenged me to the brink of my resources, but recovery has been slower than a Pluto Return and felt like one. I addressed the psychological side of the issue, but even though I’d been waking up in the middle of the night from back pain, it took me some time to realize that I had to take new actions on the side of the physical. A friend referred me to a new chiropractor who works with a method that requires a lot of pre-evaluation, including x-rays. Not only did the x-rays confirm the status of arthritis I already knew I had. They uncovered a previously unknown condition in my mid-back that explained why I was having a hard time getting out of chairs, bending over, etc. Pain ultimately brought me to the x-rays, a long time after I should have arrived already. The new chiropractic adjustments have been a booming success from the gate. The first one was so intense; I almost saw stars! The release had so much impact; it took me a couple of days to adjust to the neurological shift. Also as a result of the x-rays I’d have never had, but for a new doctor requiring them, I’ve been referred to a pain clinic in my medical group that offers many other services, traditional and non-traditional. All this good fortune from x-rays. Holy Jupiter! A New Look at Your Sabians. I have long loved the Sabian symbols, but I have been just as mystified by their somewhat convoluted language. Thanks to Sabian experts like Lynda Hill, Blaine Bovee and several other pioneers in Sabian interpretation, I have had authorities to consult when I’m trying to decipher what a particular symbol might mean for me. However, my recent x-ray experience pointed me in another direction as a starting point, one that’s more simplified. Just like tarot cards, the Sabians are an oracle. In How I Read Tarot Cards and Oracular Spectacular, I talk about leading with intuition and how you and/or a consultant respond to the pure symbol. Leave the book and any classical meanings till last, because your visceral and “off the top” response often will give you the most personalized information. I never thought of applying this to the Sabian symbols, but the x-ray experience was a big aha about how it works with this oracle system, too. I’m not saying to abandon what the experts have to say, but because of the complex imagery—and in order to personalize it—it often helps to start simply. You know, how they tell you when taking a multiple choice test, go with your first response. It’s often right. And speaking of tests, any visual oracle is like a Rorschach ink blot test. What you see is what’s going on. To give another for-instance, my husband has an exact Moon/Saturn conjunction in Leo on the Sabian, A Chemistry Teacher. With his multiple health conditions, he takes a boatload of medicine. His humorous response to this fact of life is the old DuPont slogan, “Better living through chemistry.” For weal or woe, Tim has taught others around him, including me, the benefits and downside of drugs. Oddly (or maybe not so oddly with this Sabian on his Moon), he has managed to benefit more than not from the drugs he takes, even given the large load. Go figure. Saturn points to the traditional or institutional, so I guess I shouldn’t be surprised that “establishment medicine” has done him well for the most part. Makes him feel better (Moon). Take a new look at your Sabian symbols. Create a document with the degree of each of your planets and sensitive points (angles, nodes, Part of Fortune or Spirit, Vertex or whatever ones are meaningful to you). Remember to round up unless the degree is exactly 00, e.g. 12 Pisces 00 is 12 Pisces. (Twelve Pisces 01 is 13 Pisces.) Write just the text of the symbol next to the degrees. Keep this Sabian snapshot of your birth chart and learn the “pictures” each symbol suggests. Notice how they play in your life. And if you’re looking for what brings love (Venus), vitality (Sun) or fortune (Jupiter)—or any other specific outcome, get to know the symbol on its planetary representative. This simple observance may surprise you as much as it did me. So that's why I've always wanted to create art with X-rays... Venus 15 degrees Scorpio in the 10th, ha! Thanks for your site, I'm totally digging the Chiron stuff. But wait... that's not right; oh, it's Neptune at 25 degrees Scorpio, even more apropos!